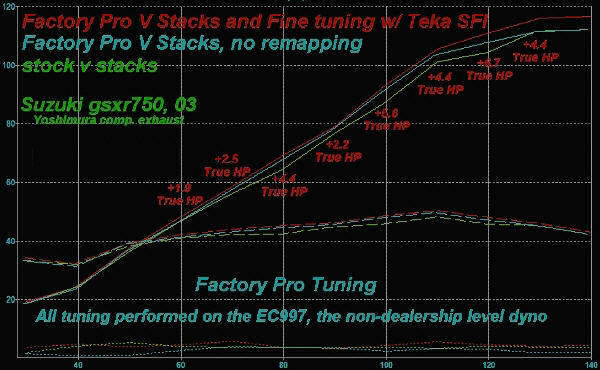 The BLUE line is the Factory Pro V Billet V Stacks, without fine tuning the stock computer with a Teka SFI Fuel Injection tuner. Better than stock at every rpm point. For years, most professional tuners have been aware of the sag in power at 12,000 rpm - It's there on most stock 750 Suzuki's and you can even see it on a dynojet dyno. The RED line is with the addition of Factory Pro Billet V Stacks, with a few moments of care, tuning on an EC997 dyno with the Suzuki tuner's secret, TEKA SFI. The 00-05 750's (and 1000's and 600's!) need help in shifting. Track tests report that 2nd gear had a repeatable ability to pop out into "neutral" under hard acceleration. Aside from that, the late style gsxr shift action is very flat feeling and gives very little tactile feedback as to confidence that it's really in gear or not. I hate it when you shift and you can hear the shift mechanism sort of lazily "kathwaka" into it's final gear location. I like a confident, proper "snick"! They had it so close to "almost good" in 98-99 - I'm not sure why they changed it for the "non-better".... Oh well - After redesigning and testing and redesigning and testing, and redesigning and testing...... I now see how easy it is to get it wrong, though. We have a new detent "star" with a copyrighted profile (yep, the "science failed, so, it's artwork - so it's copyrighted) that includes a particular combination of compound arcs and radii that produces a shift action that makes it almost impossible to miss a shift ("almost" is the key word here! ), especially 2nd gear. At least, if you miss 2nd, now, you will be REALLY surprised - cause it's now such a rare occurrence. Downshifting confidence is 100% easier and better, also. Maybe that's just as important as not missing upshifts! I'm happy with the "star" and couldn't possibly change it for the better and I figure that it will take Suzuki 2 years to copy it! As an addition to your EVO Shift Star or by itself, you will miss fewer shifts, shift even quicker and help prevent shift fork damage caused by missed shifts. Suggest both the spring and the Microbearing detent arm. 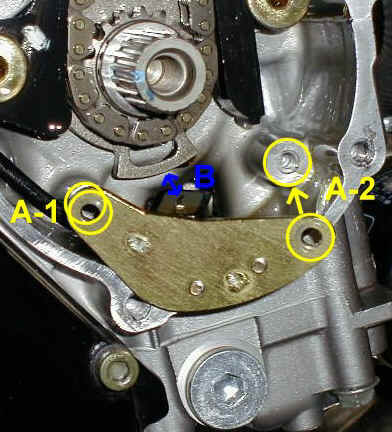 "Slightly" stronger F-Pro shift spring for the above Shift Star. For the quickest shifting - use this spring, too. If using a quickshifter, you MUST shorten shift kill duration TO to 45-50ms. Tune 1 - tune 100. 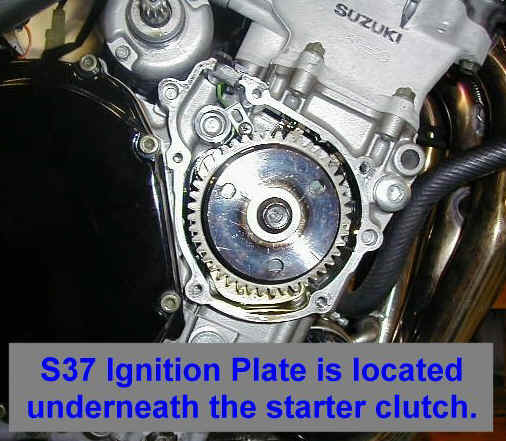 The Suzuki ECU tuning tool the industry has been missing until now. Teka "SFI" Fuel Injection Tuner for Suzuki. USA NATIONAL Championship Winning Performance! 2005 Hooters / Michael Barnes / Full Spectrum - 6 US track records! Wide range with fine increments - perfect for late model FI Suzuki motorcycles. Taking the Fuel Injection by storm. Most reliable of all FI fueling tuning tools. Does NOT lose maps or cause ignition scatter (more high rpm power - better low rpm smoothness. Teka allows the user to dial in Suzuki fuel injection systems. Adjusts low speed / idle (unlike other permanent add-on boxes like pc/yems) and also adjusts different ranges of throttle opening, up to and including full throttle. IDLE CIRCUIT: Make changes as bike is running, real time, unlike other FI adjuster boxes - absolutely saving time when adjusting the low speed mixture. Select a cylinder and make it richer or leaner - as the bike is idling. Just like adjusting fuel screws - except you don't get your hands dirty! Makes idle adjustment a 3 minute joy instead of a 15 minute, vague, aggravation! RUN CIRCUIT RANGE: Make changes as bike is running - on road or dyno. Teka extends the range, as compared to Yosh box, from max. 10 to max. 20 for those high hp applications and when you need more fuel, like our 2000 model gsxr750 that thrived on +5 at part throttle and +15 at Mid Throttle and -2 at Full Throttle. Teka provides smaller throttle position increments, too. 1% to 10%, 11% to 25%,26% to 50%, 51% to 75% and 76% to 100% in proto Teka. Addresses Hayabusa off-idle glitches, where you need to richen up the "very small throttle opening" or just above that to address "hiccups". Check the fueling on your local Low Inertia 4 Gas EC997 dyno, adjust the stock ECU for maximum power, set it and take your Teka Fuel Injection Programmer away with you. That's good for 1-2 True HP over pc2 on a Hayabusa installation when tested under load on real dyno. Call to order a set. 10% discount when ordered in a set! For Race or Street use. Absolutely the strongest cover you can buy. Highest strength / weight ratio available! Maximum protection at under 1 pound of additional weight! More cover thickness than stock on both RH and LH side covers. Visible on LH side - Can be show polished to a mirror finish! The RH "slider" is a short unit, and is designed to fit behind the stock fairing to add support to the fairing in case of an "upset". Includes: Covers, gaskets and replacement stainless steel allen screws. 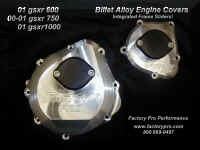 The BEST, most protective billet aftermarket engine cover in AMA Pro Racing! Required in many other race organizations. The TEKA FI system is an add-on box that either intercepts sensor signals before entering the original ECU (Engine Control Unit) or modifies the FI sensor or ignition coil outputs after leaving the stock ECU - or a combination of the two, in order to modify ignition timing and cylinder fueling for increased power. The unit is an advanced example of the pc2 and 3 concept and avoids the pc2's power losing ignition scatter problem. THE HIGHEST HP FILTER AVAILABLE!!! Designed by the same Italian craftsmen that developed Ferrari's F1 Air Filters - this filter filters well, flows more air and lets the engine make more power than the stock air filter. Cleanable BMC air filter systems (avail. direct from Factory Pro) for more power - click here for more information. True Rear Wheel Horsepower tm scale - difference between other scales. +3 to +4 at peak and part throttle low and mid w $375 Factory Pro Power ECU Flash.